Office: Room A37-305, Forest Biodivesity Building, NCYU. Address: 300 University Road, Chiayi (60004), Taiwan, ROC. Chinsu Lin received his B.S. degree from National Chung Hsing University (NCHU), Taichung, Taiwan in 1986, M.S. and Ph.D. degrees from National Taiwan University (NTU), Taipei, Taiwan in 1988 and 1996, all in forestry. Dr. Lin is a certified forester. He joined the faculty of the Department of Forestry and Natural Resources at National Chiayi University (NCYU), Taiwan in February 1997, where he is currently a professor and the Director of the Remote Sensing and Forest-Biogeoscience Laboratory (RSFBioL). 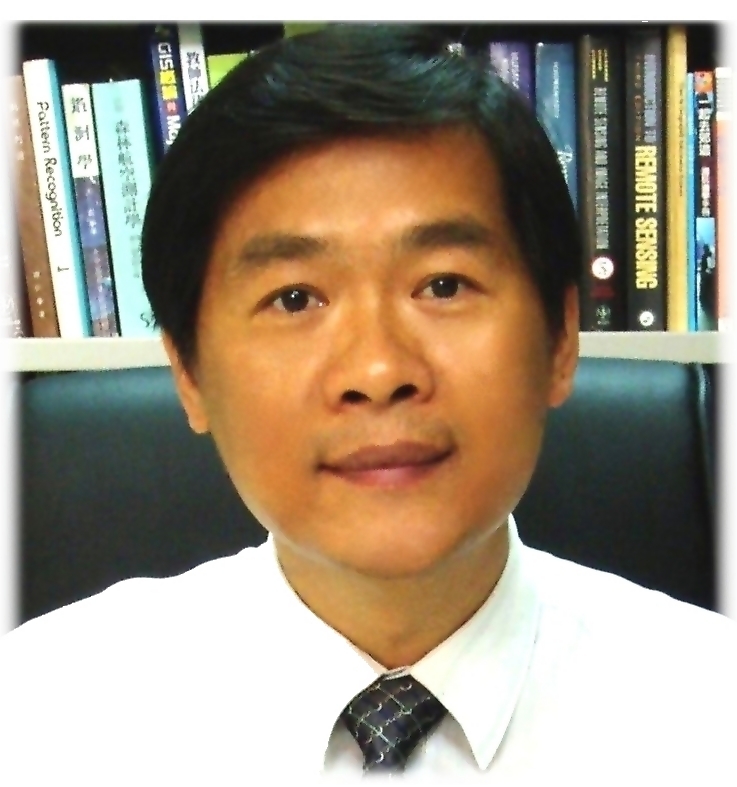 Dr. Lin had been served as Professor Chairman of the Department during August 2004 and July 2011. His research interests include multispectral and hyperspectral signal processing, image classification, forest metrics assessment, and geospatial information analysis. He is currently investigating applications of remote sensing and GIS techniques for forest ecosystem management; the major applications includes biophysical and biochemical research, automatic delineation and mapping of individual tree canopy, volumetric modeling with airborne LiDAR data, forest biomass and productivity, carbon sequestration estimation, individual-based tree species classification, and 3D-based scenic beauty evaluation (3D-PPGIS). He also makes efforts at upgrading the forest inventory accuracy as well as the exploration of species-based dynamics of pristine mixed forest by incorporating the techniques of hyperspectral and hyperspatial remote sensing, LiDAR remote sensing, GIS, and GPS. Dr. Lin is currently on the Editorial Board of two international journals: “Remote Sensing Open” and “Information Processing in Agriculture” and serves as the Standing Director of The Taiwan Group on Earth Observation (TGEO) as well. Dr. Lin welcomes and would appreciate fully collaborations with international students and scientists carrying out the research of spatial science in forest ecosystem and the earth observations. Hsiu-Chen Chiang and Chinsu Lin*, 2014. Relationship between hiking accidental events and environmental factors – a case study of Yushan-Main-Peak Trails in Yushan National Park. Quarterly Journal of Chinese Forestry 47(1):79-94. Chinsu Lin*, Ching-Peng Chang, Ya-Nan Wang, Siao-En Ma, and Che-Wei Liu, 2012. Early Stand Growth of Swietenia, Pterocarpus and Araucaria Plantations on Jiujiu Farm Forest. Quarterly Journal of Chinese Forestry 45(2):151-167. Ya-Nan Wang, Chinsu Lin*, Siao-En Ma, and Ming-Jer Tsai. 2011. Long-term Volume Growth Changes of Sugi (Cryptomeria japonica D.Don) Stands in Xitou Tract. Jour. Exp. For. Nat. Taiwan Univ. 25(1): 67-80. Dugarsuren Narangarav and Chinsu Lin*. 2011. Investigation of vegetation dynamics of Mongolia using time series of NDVI in response to temperature and precipitation. Mongolian Journal of Biological Sciences 9(1-2): 9-17. Tsogt Khongor, Chinsu Lin*, Zandraabal Tsogt. 2011. Diameter structure analysis of forest stand and selection of suitable model. Mongolian Journal of Biological Sciences 9(1-2): 19-22. Lin C.*, C.S. Lo, G. Thomson. 2011. Estimating individual tree characteristics using the MMAC algorithm and a lidar-derived canopy height model. Journal of Earth Science and Engineering, 1: 35-41. Chang C.I., Chakravarty S., Lo C.S., Lin C., 2010. Spectral feature probabilistic coding for hyperspectral signatures. IEEE Sensors Journal 10(3): 395-409. (SCI, IF=1.852). Chinsu Lin*, Siao-En Ma, 2010. A Simulation of the Stand Dynamic of Fraxinus formosana Forest in Cultivated Land using the SORTIE-ND Model. Jour. Exp. For. Nat. Taiwan Univ. 24(1): 63-78. Woanshya Liu, Chinsu Lin*, Su-Ling Liu, Ya-Nan Wang. 2010. Relationship Between Climatic Factors and Radial Growth of Cinnamommum camphora in Different Altitudes Plantations. Quarterly Journal of Chinese Forestry 43(4):557－568. Chan MH, Wang YN, Kao YC, Chen JH, Lin C.*, Hsiao WW, 2006. Application of visual tree assessment evaluate failure and healthy –a case study of old growth trees in Taichung County," Journal of the Experimental Forest of National Taiwan University. 20(2): 23-35. Lin C.*, Huang J.P., Ko C.C., and Chang C.I., 2005. Open Land Individual Tree Crown Identification and Delineation using High Resolution Satellite Imagery. Quarterly Journal of Chinese Forestry 38(2): 163-178. Lin C. *, Chen F. S., 2004. Effects of neighboring points and distribution shape of the ordinary kriging model in estimating the rainfall errors. Quarterly Journal of Chinese Forestry 37(1): 61-75. Lin C., 2004. Study on the application of GIS techniques in the geographical pattern of wildlife species diversity. Journal of Photogrammetry and Remote Sensing 9(1):77-94. Lin C., 2004. Dependence of reflected radiance and reflectance of the forest vegetation on the incident solar radiance – a case study of Cyclobalanopsis glauca. Asian Journal of Geoinformatics 4(3): 35-44. Lin C., Liu Y. C., 2003. Study on the impact of z-tolerance of TIN facets on reconstructing high resolution DTM from contour lines. Journal of National Chiayi University, 75: 199-222. Lin C., 2003. Study on the application of digital image of aerially color photographs in the paddy field patches and area survey. Journal of National Chiayi University 75: 181-198. Lin C., Chen F. S., Liou J. C., "Using GIS technique to investigate the annual gross quantity of the forest preserved water with the case of Chiayi area," Journal of Photogrammetry and Remote Sensing, Vol. 7, No. 2, pp. 39-60, 2002. Lin C., Kuan L. H., "Applications of aerial photogrammetry and GIS techniques on mapping the forest types and terrain characteristics of the Alishan Natural Reserve Area," Journal of Photogrammetry and Remote Sensing, Vol. 7, No. 1, pp. 35-52, 2002. Lin C., 2001. A statistical based hybrid PN criterion for band selection of airborne hyperspectral data for land covers classification. Journal of Photogrammetry and Remote Sensing 6(3):1-20. Lin C., 2001. Application of airborne DAIS hyperspectral data of land uses classification of marine area. Quarterly Journal of Experimental Forest of National Taiwan University, 15(1): 15-24. Lin C., Chen Y. K., Liou J. C., 1999. Spatial analysis of bare land increment caused by the Herb typhoon in Chiayi slopeland area. Journal of Chinese Soil and Water Conservation 30(3): 223-233. Lin C., 1999. Study on the opotimal value of adjustment factor in TM SAVI for estimate the forest canopy closure. Quarterly Journal of Chinese Forestry 32(3): 333-346. Lin C., "Study on seasonal changes of spectral reflectance of forest vegetation," Taiwan Journal of Forest Science, Vol. 14, No. 3, pp. 289-305, 1999. Lin C., "A case study on the application of spectral vegetation indices on the canopy closure estimating models in forest resources survey," Quarterly Journal of Chinese Forestry, Vol. 31, No. 1, pp. 51-63, 1998. Lin C., "Study on the effects of forest cover and relief factors on TM data," Journal of Photogrammetry and Remote Sensing, Vol. 3, No. 4, pp. 15-37, 1998. Lin C., Liou J. C., Chen G. Y., "The research on bare area of six districts in Chiayi slope land," Journal of Chinese Soil and Water Conservation, Vol. 29, No. 2, pp. 97-104, 1998. Lin C., Chiao K. M., 997. Study on the change detection of ecological environment by using the remotely sensed data- an illustration of Tainan district, Journal of Photogrammetry and Remote Sensing 2(3): 37-76. Lin C., 1997. Study on the application of dynamic learning neural network for land use classification in broad-leaved forest stand, Quarterly Journal of Chinese Forestry 30(2): 151-164. Lin C., 1996. A case study on the causal structure of landuse in urban area – an example of Tainan city. Quarterly Journal of Chinese Forestry 29(2): 79-92. Lin C., 1996. Study on the causal structure of landuse classes by using the ridge path analysis method. Quarterly Journal of Chinese Forestry 29(2): 59-78. Lin C., Shen M. L., 1996. A case study on the biased parameter assessment of ridge regression model for the landuse development researches with concepts of path analysis and model predictive efficiency. Chinese Agronomy Journal 6: 137-145. Lin C., 1995. A study on temporal database design for natural resource and environment change researches. Quarterly Journal of Chinese Forestry 28(2): 23-42. Lin C., 1994. Study on the stratified clustering analysis for detecting the land cover changes. Quarterly Journal of Experimental Forest of National Taiwan University 8(3):99-112. Chinsu Lin, 2014. Aboveground carbon estimation of forest stands using tree-based LiDAR metrics and growth competition index. Sustainable Forest Ecosystem Management in Rapidly Changing World - Joint International Symposium by Korea, Japan and Taiwan. May 28-30, Seoul, Korea. Sian-En Ma and Chinsu Lin*, 2014. Effects of Scale Parameter on Image Segmentation and Classification Accuracy. 2014 International Conference on Earth Observations and Societal Impacts (2014 ICEO&SI), June 22-24, Miaoli, Taiwan. Chao-Cheng Wu, Yi-Ling Chen, Jheng-De Wu, Chinsu Lin*. 2014. Spectral-based Multi-level Morphological Active Contour algorithm for Individual Tree Detection and Crown Delineation. IGARSS 2014: Quebec City, Canada, July 13-18, 2014. Sian-En Ma, Chinsu Lin*. 2014. Effects of Scale Parameter on Image Segmentation and Classification Accuracy. The ICEO & SI 2014. National United University, Miaoli, Taiwan. June 20-24, 2014. Chinsu Lin*, Khongor Tsogt. 2014. A Classification for Mapping the Distribution of Tree Species in Mixed Forests. 2014: International Symposium on Sustainable Forest Ecosystem Management in Rapidly Changing World. Seoul, Korea. May 28-30, 2014. Chinsu Lin* and Chao-Cheng Wu, 2013. Using spectrotextural features of pansharpened SPOT multispectral image for forest type classification. 2013 KAGIS Fall Conference. Oct. 30 - Nov. 1, Jeju Island, Korea. Chinsu Lin*, Chao-Cheng Wu, Che-Wei Liu, Khongor Tsogt, Siao-En Ma, and Hsuan Ren, 2013. A comparison of pixel-based and object-based classification of land use and land cover using WorldView-2 imageries. Joint International Symposium by Japan, Korea, and Taiwan 2012. Sep 5-7, 2013. Kyushiou, Japan. Yi-Ling Chen, Chao-Cheng Wu, Hung-Chang Lin and Chinsu Lin*, 2013. A parallel approach of multi-level morphological active contour algorithm for individual tree detection and crown delineation. 2013 IEEE IGARSS Conference. July 21-26, Melbourne, Australia. Chinsu Lin, 2012. The MMAC algorithm and its applications in tree-based forest inventory. Sustainable Forest Ecosystem Management in Rapidly Changing World. Joint International Symposium by Japan, Korea, and Taiwan 2012. Sep 12-14, 2012. Ilan, Taiwan. Shih-Yu Chen, Chinsu Lin, Yen-Chieh Ouyang, Chein-I Chang, 2012. Unsupervised Multispectral Image Classification. IEEE Workshop on Hyperspectral Image and Signal Processing: Evolution in Remote Sensing. June 4-7, 2012. Shanghai, China. Chinsu Lin*, Desi Trianingsih. 2012. Evaluation of the Reliability of Classifiers for the Mapping of Mangrove Forest using Landsat TM Images. The 2nd International Conference on Electric Technology and Civil Engineering (ICETCE 2012). May 18-21, 2012. Three Gorges, YiChang, China. Proceedings of the 2012 Second International conference on Electric Technology and Civil Engineering. pp.1199-1202. IEEE Computer Society Washington, DC, USA. DOI: 10.1109/ICETCE.2012.291. Chinsu Lin*, Kanokphon Techati. 2012. An Exponential Decay Model for the Estimation of Phalaenopsis Leaf Moisture Percentage (LMP) using the Spectral Signature at 1450 nm. The 2nd International Conference on Electric Technology and Civil Engineering (ICETCE 2012). May 18-21, 2012. Three Gorges,YiChang, China. Proceedings of the 2012 Second International conference on Electric Technology and Civil Engineering. pp.254-257. IEEE Computer Society Washington, DC, USA. DOI: 10.1109/ICETCE.2012.63. Narangarav Dugarsuren, Chinsu Lin*, Khongor Tsogt. 2011. Land cover change detection in Mongolia in 2000 and 2009 using MODIS imagery. The 32nd Asian Conference on Remote Sensing (ACRS 2011). Oct 3-7, 2011, Taipei, Taiwan. Chinsu Lin*, Chein-Shun Lo, Gavin Thomson. 2011. A Textural Modification of the MMAC Algorithm for Individual Tree Delineation in Forest Stand using Aerial Bitmap Images. Proceeding of the 4th International Congress on Image Signal Processing (CISP 2011), 15-17 October 2011, Shanghai, China. Shih-Yu Chen, Yen-Chieh Ouyang, Chinsu Lin and Chein-I Chang. 2011. Iterative Support Vector Machine for Hyperspectral Image Classification. 2011 IEEE International Geoscience and Remote Sensing Symposium. July 25-29, 2011, Vancouver, Canada. Tsogt K., Lin C. *, Dugarsuren G., Zandraabal, T. 2011. Larch Stand Structure Analysis of Boreal Forest in Mongolia. 2011 2nd International Conference on Environmental Science and Technology-ICEST 2011. February 26-28, 2011, Singapore. Ajeng A., Lin C. *, 2011. Application of SAM and SVM Techniques to Burned Area Detection for Landsat TM Images in Forests of South Sumatra. 2011 2nd International Conference on Environmental Science and Technology-ICEST 2011. February 26-28, 2011, Singapore. Lin C. *, Hscieh M., 2010. Adjacency Effect to Hyperspectral Signatures in Field Spectroscopy - The Influenece of Pixel Size and Polarization of Light Energy. The 2010 3rd International Congress on Image and Signal Processing. 16 – 18 October 2010, Yantai, China. Chinsu Lin*, Shih-Hsiang Hung, Gavin Thomson, Chien-Shun Lo, and Yu-Dung Lin. 2010. A 3D-Based Simulation Method for Scenic Beauty Evaluation of Forest Recreation Area. IUFRO XXIII World Congress. Aug 23-28, 2010. Seoul, Korea. IUFRO and Korea Forest Research Institute. Chinsu Lin*, Chien-Shun Lo, Gavin Thomson, Ming-Shein Yang, 2010. Application of the MMAC algorithm to tree height and crown diameter estimation in mountainous forest. ISPRS Aug. 9-12, 2010. Kyoto, Japan. International Archives of the Photogrammetry, Remote Sensing and Spatial Information Science, Volume XXXVIII, Part 8, Kyoto Japan 2010. p700-704. Shih-Yu Chen, Chinsu Lin, Yen-Chien Ouyang, and Chein-I Chang, 2010, A New Application of Pixel Purity Index to Unsupervised Multispectral Image Classfication. 2010 IEEE International Geoscience and Remote Sensing Symposium. July 25-30, 2010, Honolulu, Hawaii, USA. Chewei Liu, Chinsu Lin*, 2010. Integration of Remote Sensing and Multivariate Statistical Analysis for SPNP Ecosystem Features Extraction. 2010 Two-Sides of Strait Symposium on Remote Sensing. March 15-19, 2010, Chungli, Taiwan. Chinsu Lin*, Khongor Tsogt, 2009. A Signal Restoration Method to the Infrared Spectral Reflectance of ASD Fieldspec PRO Spectroradiometer. Proceeding of ASPRS 2009 Annual Conference Baltimore, Maryland March 9-13, 2009. Chinsu Lin*, Chien-Shun Lo, Ming-Shein Yang, and Gavin Thomson, 2009. An Algorithm for Delineating Tree Crowns of Forest Stands in a Mountainous Area Using Active Contour Model. Proceeding of Silvilaser 2009, ISPRS. Silvilaser 2009, Oct. 14-16, 2009. College Station, Texas, USA. Texas A&M University. Chinsu Lin* and Khongor Tsogt, 2009. A signal restoration method for the infrared spectral reflectance of spectroradiometer measurement. ASPRS 2009 Annual conference. March 9-13, 2009. Baltimore, Maryland, USA. American Society of Photogrammetry and Remote Sensing. Chinsu Lin*, 2009. Feasibility of the Sustainable Management of Afforestation in Agricultural Lands. Two-Sides of Strait Sumposium on Agricultural Resources and Environment Protection. Xiaman, Fukien, China. Chinsu Lin*, Chun-Hsiung Lin, Ming-Hsun Chan, Jiunn-Cheng Lin, 2008. An Evaluation of Carbon Sequestration of Crop Farming and Afforestation on Cultivated Land International Symposium on Toward the Establishment of the Multi-purpose and Long-term Forest Management Plans. Chinsu Lin, 2008. An evaluation of carbon sequestration of crops farming and afforestation on cultivated land forest. Yamagata, Japan. Yamagata University. Chinsu Lin, 2008. An evaluation of carbon sequestration of crops farming and afforestation on cultivated land. Joint International Symposium on Toward the Establishment of Multi-purpose and Longterm Forest Management Plans by Japan and Taiwan. Tsuruoka, Japan. Yamagata University, the Japan Society of Forest Planning and IUFRO Div.4.02.02. Chan Ming-Hsun, Chinsu Lin, and Ya-Nan Wang, 2007. Tree ring research age structure, dynamics and growth pattern of the shenmu broadleaf conservation forest in Taiwan. The Advances in forest and natural resource management symposium: Sustainability, Integration, Modeling, and Technologies. pp. 10. Sitou, Nantou. NTU Experimental Forest. Chan M.H., Lin C., Wang Y.N., and Kuan L.H., "Tree ring analysis age structure, dynamics and wood production of the Shenmu Broadleaf Conservation Forest in Taiwan," 7th International Conference on Dendrochronology, pp. 38, 2006. Lin C., Chan M.H., and Chen F.S., "Age structure, population dynamics and growth pattern of an endangered species Amentotaxus formosana," 7th International Conference on Dendrochronology, pp. 85, 2006. Lin, C. and Tsai C.Y., "Analysis to multispectral Fomosat-2 signatures of vegetation," Symposium of COA Sponsored Remote Sensing Projects ion 2005, pp. 1-12, 2006. Lin C. and Wu S.J., "Connect the productivity of Chamaecyparis species to the environmental factors of forest land.," Proceeding of 2005 Symposium on Spatial Information for Natural and Social Science Appications, pp. 168-188, 2005. Chan M.H., Lin C., Kuan L.H, and Chen S.E., "An extreme climate typhoon disturbance effect on Taiwan spruce tree ring.," Proceeding of 2005 Symposium on Spatial Information for Natural and Social Science Applications, pp. 144-167, 2005. Yang Y.C. and Lin C., "Locating accuracy assessment for the application of hand-held GPS in the forest land survey," Proceeding of 2005 Symposium on Spatial Information for Natural and Social Science Applications, pp. 80-95, 2005. Lin C. and Huang S.C., "Clarifying some problems for estimating the hotspot of the conservative wildlife," Proceeding of 2005 Symposium on Spatial Information for Nature and Social Science Applications, pp. 110-123, 2005. Ko C. C., Lin C., Huang J. P., "Automatic Identification and Delineation of Tree Crowns Adapted to Different Landscape," 2005 Computer Vision & Graphic Image Processiong. Taipei, Taiwan. 21-23, August., pp. CD_ROM, 2005. Ko C. C., Lin C., Huang J. P., Hsu R. C., "Automatic Identification of Tree Crowns in Different Topology," The Fifth IASTED International Conference on VISUALIZATION, IMAGING, AND IMAGE PROCESSING. Benidorm, Spain. September 7-9, 2005., pp. CD_ROM, 2005. Wang J., Chang C.I., Chang C.C., Lin C., "Binary coding for hyperspectral imagery," 49th Annual Meeting, SPIE International Symposium on Optical Science and Techology, Imaging Spectrometry X (AM105), Denvor, CO, August 2-4, 2004. Proceedings of SPIE, Vol. 5546, 2004. Liou Y. C., Lin C., "The relationship between the spectral signature and vegetative canopy density," 2003 Conference on Chinese Forestry Research, pp. 463-472, 2003. Lin C., Ku N. W., "Study on the temperature estimation of forest land using thermal infrared images," 2003 Conference on Chinese Forestry Research, pp. 19-27, 2003. Lin C., Zheng X. Z., Lin C. H., "Interpretation and mapping of forest land covers using the digitally color photogrammetric images," 2003 Conference on Chinese Forestry Research, pp. 63-71, 2003. Ren H., Lin C., Chang C. I., "Subpixel Land Covers Detection and Classification for Hyperspectral Imagery," SPIE International Symposium: Photonics East, Vol. 5628, pp. 282-287, 2003. Lin C., Chang C. I., "Study on the relationship between the forest canopy closure and hyperspectral signatures," ACRS 2003 ISRS, Vol. 2, pp. 942-944, 2003. Lin C., Chang C. I., "Dependence of land use and spectral information in the aspect of band selection of seashore and urban hyperspectral data," the 5th International Airborne Remote sensing Conference, pp. CD-ROM, 2002. Lin C., "The Dependence of reflected radiance and reflectance of the forest vegetation - a case study of cyclobalanopsis glauca," the 22nd Asian conference on Remote Sensing, Vol. 1, pp. 610-615, 2001. Lin C., Wang C. M., Chang C. I., "Application of generalized constrained energy minimization approach to urban road detection," IEEE 2000 International Geoscience and Remote Sensing Symposium, Vol. 5, pp. 2080-2082, 2000. Lin C., "Study on the seasonal changes of spectral reflectance of forest vegetation," the 21st IUFRO World Congress 2000, Vol. 3, pp. 169-170, 2000. Lin C., "Study on the relationship among the Machilus spectral behavior and light intensity and physiological activity," the 21st Asian Conference on Remote Sensing, Vol. 1, pp. 258-263, 2000. Lin C., Chen Y. K., Wu S. J., "Application of RS and GIS in natural disaster survey: a case study of mountainous landslide caused by the Herb typhoon," the 20th Asian Conference on Remote Sensing, Vol. 1, pp. 531-536, 1999.